Rivers:- The great river fishing continues with excellent numbers of Rainbows and a few Browns for good measure. The weather on the weekend was near perfect but reports were scarce. There have been some reasonable hatches over the last few days and this will have plenty of fish moving in the evenings. Any of the high country rivers are well worth a look at present and with the rain of last week will fish very well over the next month or so. One report came in from Andrew Morrow and Alison Cork from Canberra. They fished the Eucumbene River for 3 Rainbows and 2 Browns. Fish all took Royal Wulffs. They also Three Mile Dam and had a huge but short lived rise with fish "going nuts" on Bogong Moths. Had a red letter day (for me) on Friday on the Gungarlin, caught 12-15 fish and missed many more, all on dries (Red Tag, Royal Wulff and Deer Hair Caddis), size ranged from 6-11.5 inches (PB on Gungarlin for me), heaps of fun on a short 2wt, and there were a lot of fishing rising when I left about 1400. The dry fly fishing has been great. There are more and more insects becoming active with the warmer weather. Expect Caddis, Mayflies and Midges. Terrestrials such as Beetles and Ants are in abundance. Lake fishing was hampered by high winds, snow, hail and rain during the week but there were still some keen anglers out there catching a few. There are still some very nice rainbows averaging .800 grams to 1kg being caught at present. Best flies were the Fuzzy Wuzzy, Jinde Bugger, Mrs Simpson, Stick Caddis and Mountain Shrimp. *Steve Snedden and Mark Sueli caught some nice Rainbows on Mrs Simpsons over the weekend. Lake Jindabyne:- Stewart Fagan from Canberra came came through on the most miserable of days with 40 knot winds, rain and snow and still managed to catch a nice 1.5kg Brown in the 30 minutes he fished! There are plenty of fish on the move in Jindabyne at the moment and we have had reports of some good Dun hatches. Lake Tantangara :- Still no reports from Tantangara this week, howver with the reports from the rivers and other dams in that general area would be a great option and a chance to get away from other harder fished areas. Not a great deal of reports on the troll this week. Again bad weather hampering anglers during the week. 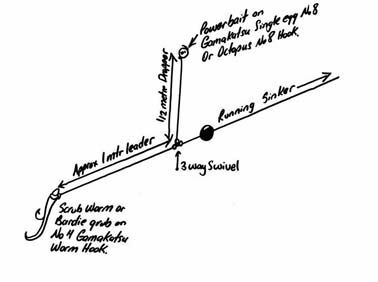 Flatline, leadcore and downrigging have all been successful methods when anglers have been able to venture out. *David and Colin from Canberra fished Jindabyne on the weekend for 2 Browns, 2 Rainbows, 2 Salmon (released), and 1 Brook Trout. Best fish was 1.5kg. 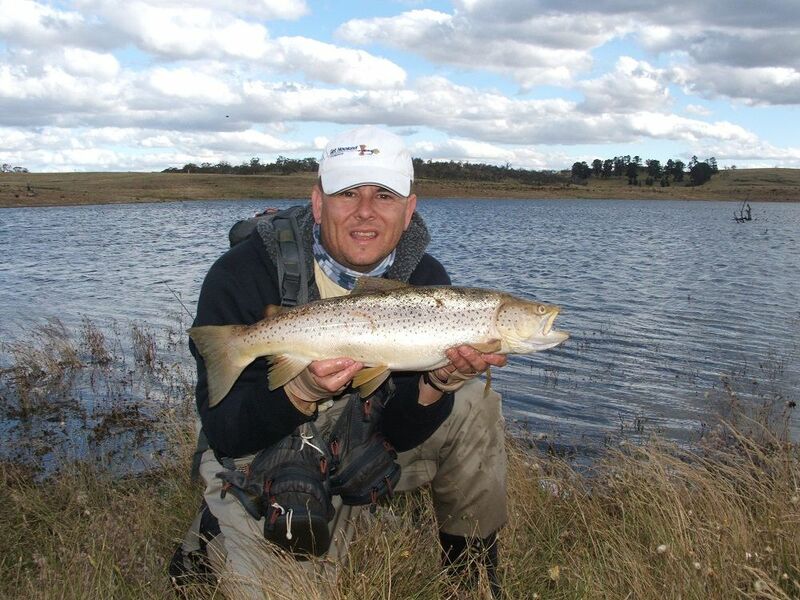 *Colin with four nice fish from Lake Jindabyne on the weekend. Best lures include Tasmanian Devils in Cols 5, 26, 50, 47, 82, and 28. Eucumbene:- The great trolling continues and launching is possible at more areas now though the Old Adaminaby ramp is still the pick if you have only a 2 wheel drive or a BIG boat. Launching is also possible at Buckenderra, The Dam Wall and Anglers Reach at present. *Jeff and Graham form Canberra with part of a catch of 14 fish from the dam wall area of Lake Eucumbene. Pink and Yellow wing Tassies trolled flatline were the best fish takers. They also reported that there were fish rising all over the lake. Best trolling areas have been around the Dam wall and main basin and the tree lined Western side of the lake. Jindabyne:- We have had some great reports back in from Jindabyne over the last few weeks. Sid's and Rushes bay have been great and around the islands has been good too. Best lures have been Dual Depth Tassies and Rapala minnows. Some really nice fish were coming in on bait over the weekend. Powerbait has been working very well and mudeyes are starting to work well also. Four anglers from the Ballarat Angling Club fished 4 days for 27 fish mostly on Couta Mudeyes's. They caught a mixture of Rainbows and Browns from 42-51cm in length. Averaged weight was about 700gms. They caught some on fly gear also.